Rated 5 out of 5 by Water gun from They have it all I just got this primarily to avoid dragging the hose out. It's great for rinsing the salt off the cars and I'm looking forward to using it at the lake this summer to clean the water line on my boat. Well thought out with nice options, all without having to be tied to a hose. Great product! Rated 5 out of 5 by Kimba57 from Loved the hydroshot I bought this to wash cars, power wash the house and it works amazing love the accessories as well would highly recommend this. Rated 5 out of 5 by Albertg601 from Great attachments and features I purchased this 3 weeks ago and used it to wash the car. It gets the car very wet with suds, then I wipe with a car wool mit. Rated 5 out of 5 by Robert H from I love my Hydro Shot I've used it twice since I received it two weeks ago. It has plenty of pressure and it's easy to use and it does a very good job. Rated 5 out of 5 by Newyorkjoe from Why use a garden hose? We have quite a few bushes and plants around our house that needs watering. I was excited to use the hydro shot to prevent me from utilizing a clumsy and heavy garden hose to water our bushes and plants. With the Hydra shot I have also washed my truck by utilizing rainwater from our rain barrels. I've had three people so impressed that they went and bought one themselves. I love this hydroshot and it has made my job so much easier and fun. It's been over 1 year since I've used my garden hose.I only wish that the water line that it comes with were another 10 ft longer. Rated 5 out of 5 by Magic Sam from Perfect application for the Hydro Shot. I found the perfect application for the Hydro Shot. Actually I find a new chore to use this tool every week. But this is the best yet. The Hydro Shot works great to rinse off my Hot Tub filter cartridges. 1. I can use hot water. No more frozen hands from the garden hose water. This is a problem for cold winter areas only. But it will mean a lot as the temperature dips to zero and below. 2. Reduced mess, because the Hydro Shot uses minimum water. Compared to the hose which makes a lake in the yard that doesn't soak into the frozen ground. 3. The perfect pressure. More than the hose or any faucet in the house to blast off the crude. But not too much to harm the paper element. If I only used the Hydro Shot for this one job, I would give it 10 stars, I would pay twice the price and still have a value. Rated 5 out of 5 by Wife in Montrose from All the features that we can use . 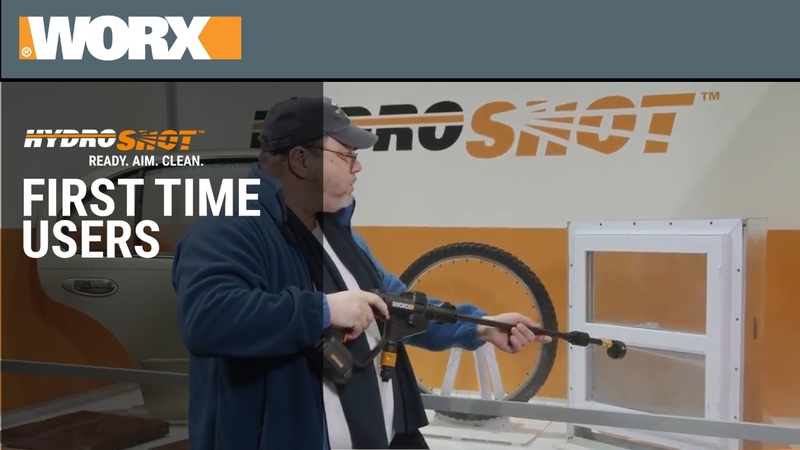 . . My husband loves and uses Worx tools . . . lawn trimmer . . . SD screwdriver . . . and soon to be used the HydroShot Power cleaner. Rated 5 out of 5 by ewt45 from Good combo This will supplement my regular pressure in doing small jobs. The big one is a pain to use because of dragging the cord and hose around. This will be used to clean the RV at the storage area. There is no water and I can bring a couple of 5 gallon buckets, turn on the generator and wash the RV. Rated 5 out of 5 by Hemiman John from Awesome tool!! I just got my tool last week and I did my job in half the time. I own a triple wide manufactured home and I have to clean it 3 times a year and this Hydroshot helped me so much. I didn't ache after I used it like I would when I washed it before. Thanks for the Hydroshot !!!!! Rated 5 out of 5 by bhturnow from Great tool! Well made and a great portable tool. Great for what it is intended to do. No complaints at all. Very handy for portable jobs! Highly recommended! Rated 5 out of 5 by 1bookmark from Works great! I was surprised how well it worked, right out of the box! MUCH better than using a traditional power washer for light to medium jobs around the house. I can honestly recommend this to all of our friends who need a way to wash items not needing a full on blasting of a high pressure capable of etching concrete! Rated 5 out of 5 by rlohmuel from Easy to use Very easy to pull together to wash down the car, driveway, front porch. Rated 5 out of 5 by Miles B from Very easy to operate! I thought this about a month ago and have used it on everything from cars boats and cleaning equipment Being a disabled vet, and having multiple operations, on both my arms and my back it is so nice to be able to use something like this without having to worry about how bad I hurt afterwards! 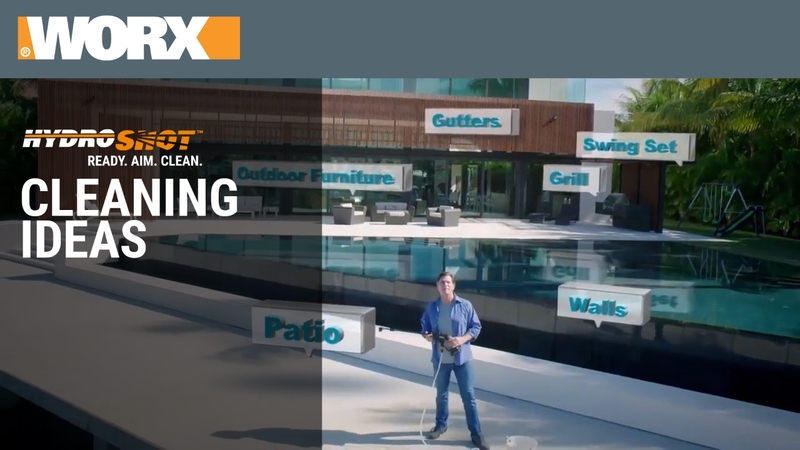 Thank you Worx, you have no idea hos greatful I am! Rated 5 out of 5 by David530 from This is the sprayer I've been waiting for. I have been using the 20V Hydroshot for a couple months, and the list of things it is useful for just keeps growing. I initially bought it to help keep my deck clean, which it does flawlessly. It has just enough power to push all the dirt, dust and leaves off. Recently I found out how useful it is for cleaning my cars and truck. This thing save me a trip to the car wash when the rims start becoming filthy. I have also found that not being a high pressure washer is crazy useful for keeping under the hood clean. Dirt, dust, grime, road debris, and rotting leaves all get powered away and off the car. Being able to run out side with a 5gal bucket means no hooking up the hose to the outside faucet. Changing the spray pattern or the pressure intensity has lent itself to having the perfect tool for so many jobs. I've even used the spray bottle to put a little fertilizer on the lawn. Can't wait to see what it's useful for next. Rated 5 out of 5 by GMARC from I bought this for my daughter for her birthday She didn't have a chance to use it yet as her day was 11/2 But when she opened the box all she could say was WOW She was doing her research on the HYDROSHOT and was so happy that all the parts came with it She didn't n have to order other parts separate I was sold on this one when I saw the WORX video. 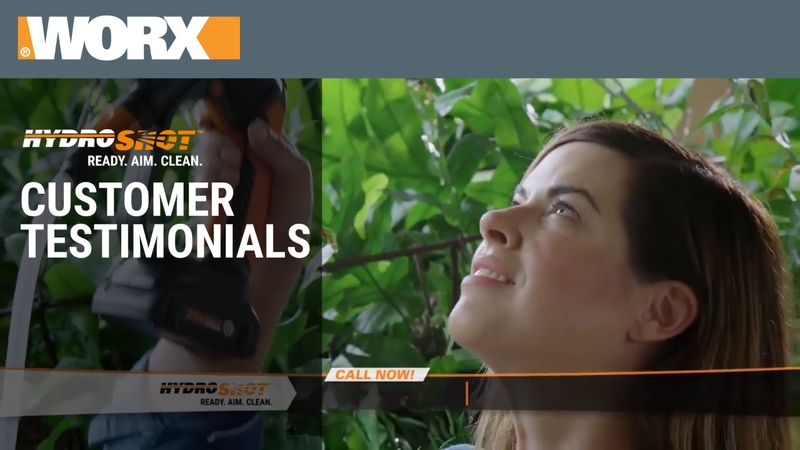 My daughter will have no problem learning how to use it at all I would tell anyone who wants to buy that WOW GIFT for someone THIS IS IT even if it is for you, its the complete set When it states BUNDLE, WORX means complete, SO YES THIS 20V HYDROSHOT PORTABLE POWER CLEANER is so worth it. The Best part is that you do not need a direct water source. All you need is a 5 gallon bucket of water. Rated 5 out of 5 by Jobeane from Great tool The best thing since “fried chicken”. It performs a multitude of tasks and I can’t praise it nearly enough. My husband has a gas power washer and this is so much easier for me to use and not nearly the mess to clean up. I LOVE IT!!!! Rated 5 out of 5 by Cleaning fool from Will save a bundle of time Have used this only a little so far, but come spring, the Hydroshot will save a bundle of time in cleaning up winter's dirt and grime. Can't wait to use all of its features. While I have used it a little thus far, it has been a great help in the jobs I used it on. Rated 5 out of 5 by DCBklyn from Fantastic Product We live in a brownstone in Brooklyn NY and use this on so many projects from cleaning the brickwork to the steps to the awning and even our above ground pool! Its super easy to assemble, easy to use and easy to store. We also purchased the turbo nozzle which is great too. Fantastic product, highly recommend! Rated 5 out of 5 by Charolette from Easy to use and has great features I bought a few weeks ago and it works wonderful. Light weight and easy to use. Rated 5 out of 5 by RobAra from Awesome cleaning tool I started using my hydroshot a few days after it came in an I was like the is the awesomeness power cleaner a guys could have. I used it to transfer some water from a utility sink to a water tub an was getting familiar with the tool. I then took a 5 gallon bucket with water an wash the mud off the inside of truck tires. It took the mud right off an the 5 gallons I used was more than I needed. It's awesome what this tool can do.